A reliable roof warranty – are you covered? The choice of roof covering for a new home is critical. It not only affects the appearance of the property, it also influences its weatherproofing, energy efficiency, sustainability and durability. Therefore, when designing, installing, and replacing roofs, there’s much to consider. 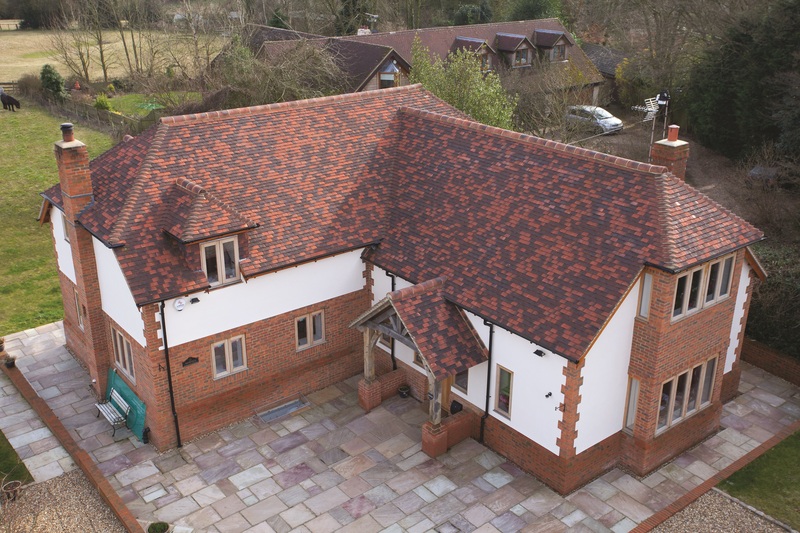 SIG Roofing’s SIGnature range of handmade, handcrafted and machine clay tiles are perfect for both new build and RMI projects; offering a life-long investment and low-maintenance solution. Even better, they are supported by a 30 year warranty that is backed by SIG, a FTSE 250 company. They are available nationwide through SIG Roofing branches. It may be that the architect has already specified the roof covering – which will be either concrete or clay tiles, natural or man-made slate. However, decisions still need to be made on which products to use, their colour, size and texture, along with any planning restrictions, and of course the budget. Roofs are made up of multiple products, so the choice of battens, fixings, breather membrane and ridges, for example, will also be carefully considered. Naturally, as builders and developers, you want to get the roof just right, especially the aesthetic as it accounts for 20-30% of the visible exterior and will determine the appearance of the property for decades. However, with the focus very much on the physical components, it’s all too easy to overlook the overall life expectancy of the roof and any warranties that may cover the products. If you’re an NHBC registered builder, you will sell your new homes complete with a comprehensive ten year warranty and insurance cover. During the first two years, your buyers have warranty and insurance protection for their newly built or converted home. However, if it fails to meet NHBC requirements, you are responsible for any repairs necessary and if the fault lies with the products you have used, you will find yourself making a claim. The last thing that any housebuilder or developer needs is a problem with the roof that leads to a claim. However, things do go wrong, and when they do, you need the reassurance that your roofing products can be relied upon in the event of defect or failure, and that the manufacturer/supplier will stand by your claim. Otherwise, not only could a claim prove costly, it can seriously discredit your reputation too. Thankfully, over the years, roofing products have become more advanced, with the quality and reliability increasing, and practically all products come with a standard twelve-month warranty – if not longer. This said, research has shown that 70% of contractors have had to replace a roofing product through a warranty claim at some time or other. Therefore, you need to be confident that the warranties offered by the products you choose are comprehensive and robust. A reputable slate supplier, such as SIGA Natural Slate for example, will honour all warranties, even if the slate quarry that supplies the slate ceases production. SIGA Natural Slate offers warranties of up to 75 years, backed by SIG – a FTSE 250 company – and they are available nationwide through SIG Roofing branches. A reliable warranty instils trust with the manufacturer, as well as confirming confidence in the product. Although it can be time consuming and confusing to assess the value of every warranty, it pays to do your homework at the specification and purchase stage rather than be faced with problems post-installation. So, how do you ensure that a warranty is reliable? Invest in quality products: It’s always tempting to be swayed by lower prices or quality, or super extended warranties. However, regardless of the size and nature of the project, quality must never be compromised. Every job, no matter how large or small, needs to be approached with confidence that the roofing products are of genuine quality and that their warranties are robust. Take natural slate, for example. Not all slate is of the same quality, and an inferior product may be riddled with inconsistencies and imperfections that can affect its durability and performance over time – resulting in high wastage and escalating labour costs. Quality slate is usually backed by a quality warranty. If something goes wrong further down the line, the slate will live up to its promise and support will be provided. Reputable suppliers: It pays to only deal with reputable companies who offer assurance that they can uphold their warranties. A supplier with a solid reputation and a long history of sourcing the products, and who can offer traceability of supply, can often be relied upon to offer warranties that will prove worthy should support become necessary. A reputable slate supplier, for example, will honour all warranties, even if the slate quarry that supplies the slate ceases production. SIG Roofing offers a single package warranty – ‘ONE Warranty’. A pitched roof product warranty to support the build-up of the roof from batten to roof coverings, it covers a comprehensive range of market-leading roofing products whose performance is covered for 15 years, all at no extra charge. Single package warranties: Whether it’s a new roof, an extension or even a repair, it‘s rare that only one product will be ever used, there will be several. Warranties are normally issued separately for each product, so that means several warranties to manage too. Keeping track of every warranty and storing them safely can be a job in itself. So, imagine having to deal with multiple suppliers in the event of a claim? It can be difficult, time-consuming, and downright frustrating and can all add up to lost revenue. Single package warranties take all the headache out of a claim and are fast becoming an attractive option to housebuilders and developers. Although they offer a number of valuable benefits, the key attraction is simplicity. When a single package warranty is purchased, just one warranty covers the performance of the key products involved in the build-up of a roof – in some cases up to 15 years. In the unfortunate event of a claim, there’s just one company and only one contact to deal with at any time throughout the process. In addition to offering complete peace of mind for yourself, it’s a sure fire way to protect your reputation too. It also means that you and your contractor can rest easy knowing that you’re using top quality products, and the homeowner will have their roofing issues resolved easily and at speed. Single package warranties also tend to include a comprehensive selection of quality market-leading products, and these can be relied upon to deliver durability and great performance. In conclusion, the impact from a claim is never really felt until the time it needs to be made – however, ironically, that’s also the time when support is needed most. Whether you’re NHBC registered or not, the importance of choosing quality products that come with reliable warranties can never be underestimated. By aligning yourself to a reputable supplier who can demonstrate quality, reliability and expertise, you can rest assured that the products you have chosen don’t compromise on quality and you will be supported in the event of a claim. Great roofs require great materials that will give both you and your customers peace of mind for years to come, so always invest in the best and make sure that your warranties provide the cover you need.